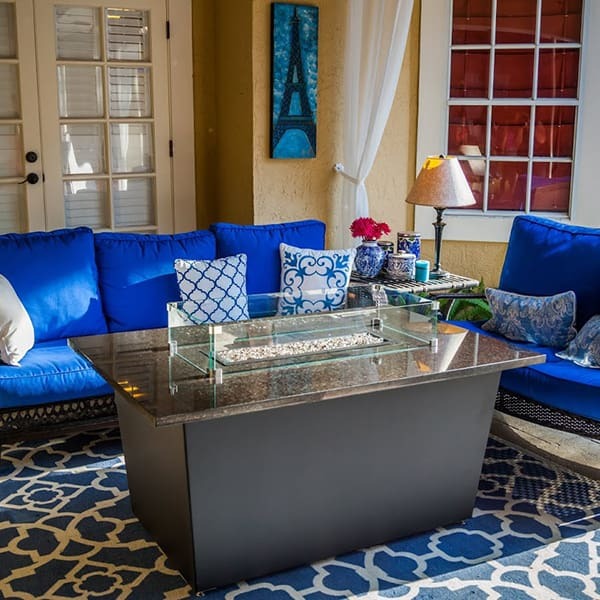 The Tuscany Fire Pit Table comes from the Firetainment line of Alfresco fire pits, which are ideal for placement in your favorite great wide open-air entertainment location in your backyard. Firetainment is skilled at presenting outdoor fireplaces that minimize upkeep and maximize usefulness. The Tuscany runs on either propane or natural gas, and the fire dances atop a bed of fire glass or lava rock that is made to last a lifetime. That means goodbye to hauling kindling, splitting wood, shielding kids from embers, and the never-ending dance of “avoiding the smoke.” For heightened utility, the Tuscany is a three-in-one firepit. It serves as a tabletop, with a spacious quartz table with polished edges, which provides ample room for place settings, games and more. Choose to add a Pan Lid to increase the table space, when necessary. Then, it serves as a traditional fire pit, as the flames offer a powerful 50,000 BTUs of warmth and glowing ambiance. Last, the open flames are useful in creating an open-air hibachi-style cooking station. Add the Firetainment Cooking Package to enjoy the use of salt blocks and more, or stick to traditional marshmallows. Let Firetainment reignite a love of the outdoors!